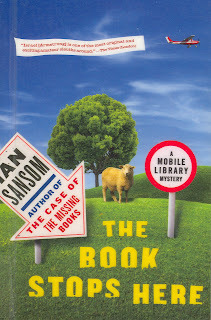 I had high hopes for the new library-centric novel The Book Stops Here by Ian Sansom. In addition, my excitement only grew when it turned out to be nearly impossible to obtain the book using Interlibrary Loan. I figured it must be a great book if it was constantly checked out and in use. This, it turns out, is the third in a series of mystery novels featuring the librarian Israel Armstrong and his grumpy co-worker, Ted. In this installment, Israel and Ted coax their aging and dilapidated bookmobile from their town of Tumdrum, in Northern Ireland, to the annual mobile library convention in London (organized by the Chartered Institute of Library and Information Professionals -- sounds much more impressive than the American Library Association, dunnit?). They are hoping to enter their bookmobile, Marilyn, in a contest to win the coveted "Concours D'Elégance" prize for the best looking van at the competition. Israel also has some unfinished business back in England, in the form of his girlfriend, Gloria. Israel and Ted arrive in England and stay with Israel's mother. Immediately, he reverts to the role of child, and is belittled and ordered about by his mother. Ted and his mother also start up a flirtation which irritates Israel immensely. To make matters worse, Gloria is not returning any of his phone or text messages. Even more alarming events occur, however, as Marilyn the van is stolen after only one night in England. There follows an amusing account of Israel and Ted attempting to track down the van and "steal it back" -- and make it to the bookmobile competition in time for the judging, too. The book is an extremely quick and easy read (which still confuses me as to why it's always out at the libraries that own it), and in a refreshing change from most mystery novels, no one is killed. However, the writing style can be a bit annoying. Take this passage, for example: "When Israel and Ted arrived back at the site the following day the travellers had gone -- disappeared, vamoosed, packed up, beat a retreat and headed for the hills." Or this one: "Israel vomited continually and consistently for most of the journey, although it was dry vomiting after a while, obviously; retching, voiding, spewing, ructating; stomach turned up and turned overboard; and down, and up, and down again . . ." (there's more, but I think you get the picture). Most writers occasionally make use of a thesaurus, but they don't feel compelled to share every single synonym they find there, do they? The book also goes off on meandering tangents that don't add anything to the story, such as Israel's meeting with two bored former friends, a useless discussion with the travellers about their beliefs, and lengthy tours of three "state of the art" bookmobiles at the library convention. The most annoying thing about the book to me as a librarian (and reader, for that matter), however, was a blatant mistake in Chapter 4. Israel, having moved from the cosmopolitan and exciting city of London to the out-back-of-beyond town of Tumdrum, has found more time to broaden his reading horizons. He goes on to elaborate for the reader the many authors and books he's recently discovered. Imagine my shock and dismay at this inexplicable sentence: "He'd even started reading Patricia Cornwell from A to Z, but they seemed to go downhill rapidly, and he'd lost interest around about D." Oh no he didn't!!! How in the world did this error get through the editing process? It doesn't take a librarian to know that the author of the alphabet mystery series is Sue Grafton, not Patricia Cornwell (although he was correct in the assertion that Cornwell's novels went downhill pretty rapidly after the first few). That mistake and the general rambling nature of the story left me feeling unsatisfied. I'm sure there will be more books in the series, but I doubt I'll be reading them.